Ali's Bookshelf: My One Wish Would Be That I Had More Of These Characters Now!!! My One Wish Would Be That I Had More Of These Characters Now!!! I've read a few books by Robyn Carr and couldn't wait to read this one, but I didn't realize it was part of a series when I was reading it. One Wish could be a great stand alone book, right away it grabbed my attention. The characters were really thought out and I couldn't wait to know more about them as I was reading. I also wanted to know what Grace, the main character, was hiding and why she went from one career to living in a small town and running a flower shop. I don't want to give too much, when it comes to her other career, so I'm not going to say what it was. But I love the way this fantastic author brought it all together. Robyn Carr is a fantastic author and I enjoyed the way she weaved her words together to create this wonderful story of love and finding what you were looking for, even when it was right in front of your face. I couldn't get enough of these characters and I can't wait to read more of this series. I already bought the first two and they are waiting for me on my Kindle right now. If you are looking for a light and fluffy romantic story, filled with a bit of mystery, then One Wish is for you. Let's talk about this cover for a few seconds before we talk about the first line of the book, I adore this cover. The beach scene with him walking on the beach by the water is a great clue for the book. The colors are beautiful and so are the fonts. I'm not sure who had their hand in choosing this cover, but they did a great job. Grace Dillon's flower shop was very quiet on the day after Christmas. Well for a first line, this one is pretty descriptive. It tells the main characters name, what day it is and where she works. I actually liked this first line and it made me want to know why it was so quiet, it also made me wonder how busy she had been before Christmas. 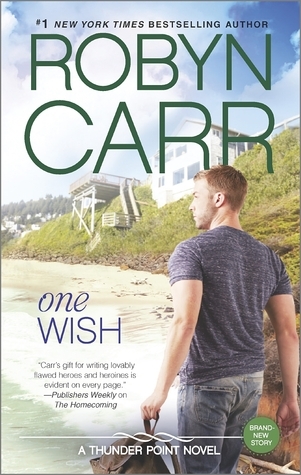 One Wish by Robyn Carr is one book that fully deserves this rating and I hope you all agree with me.